Nebraska hosted several visitors this past weekend and it seems the general consensus is that all visits went about as well as they could. How did the recruits feel about their visit? 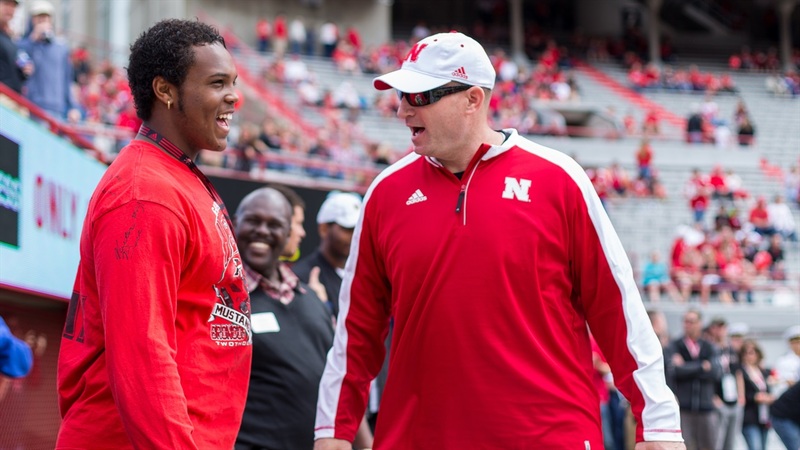 What should Husker fans know as National Signing Day gets closer? We’re recapping the weekend visits and giving a quick update on the six visitors that were in town. Austin, Texas, offensive lineman Brenden Jaimes officially visited Nebraska this weekend for the first time, sharing a photo from the field and the locker room at Memorial Stadium. My favorite tweet from the weekend? Jaimes’ response when asked what trophy he plans to win at Nebraska. He recently turned down an in-state offer from Texas, so Nebraska fans can feel pretty good that Jaimes is happy with his decision to play for the Huskers. The Mustang, Oklahoma, native has visited Nebraska multiple times before but had never taken an official visit. That changed this past weekend. Thomas, along with his mom, enjoyed their trip to Lincoln. Thomas met with Mike Riley, Bob Diaco and John Parrella. They even appeared to spend a little time at Wilderness Ridge. Thomas’ player-host was DT Carlos Davis and it sounds like both hit it off. Beyond that, it sounds like Thomas and his mom had a great time at Nebraska, which should make Husker fans feel good. The moment running back prospect Jaylin Bradley received his Nebraska offer, it was a done deal. He knew he wanted to be a Husker and he quickly gave his verbal commitment. As of this weekend, he also made his official visit. As an Omaha, Nebraska, native, Bradley has visited Memorial Stadium countless times. This weekend was clearly a different experience for him and his family and there’s no reason to believe he’ll be looking anywhere else. Nebraska is looking for a big-bodied receiver and Bryan Thompson may be the guy. He official visit also looked like it went well. He is between Boise State (where he was previously committed), Nebraska, Oregon, UCLA, Utah and Washington State. For those curious about the Huskers next steps, Riley and Keith Williams are planning to make an in-home visit to see Thompson on Thursday. This will be one to keep a close eye on over the next week, especially as he takes an unofficial visit to UCLA over the weekend. Cornerback prospect Deommodore Lenoir has pretty much settled on two programs ahead of National Signing Day: Nebraska and Oregon. He was in Lincoln this weekend, which seemed to go well enough for Nebraska. Lenoir appears to be leaning toward Oregon (and is still planning a visit to Mississippi State), but he has a pretty good relationship with Williams. This isn’t settled either way, so expect the Husker coaching staff to make a big push over the next week and a half. Elijah Blades is a 4-star cornerback who is an extremely exciting prospect for the Huskers. The only problem? He’s currently committed to Florida. For what it’s worth, Blades removed a Florida video from his profile at some point over the weekend. That probably doesn’t mean much, especially since he’s still considered to be leaning heavily toward Florida. However, Nebraska coaches will be pushing hard ahead of National Signing Day to hopefully flip Blades to the Huskers.